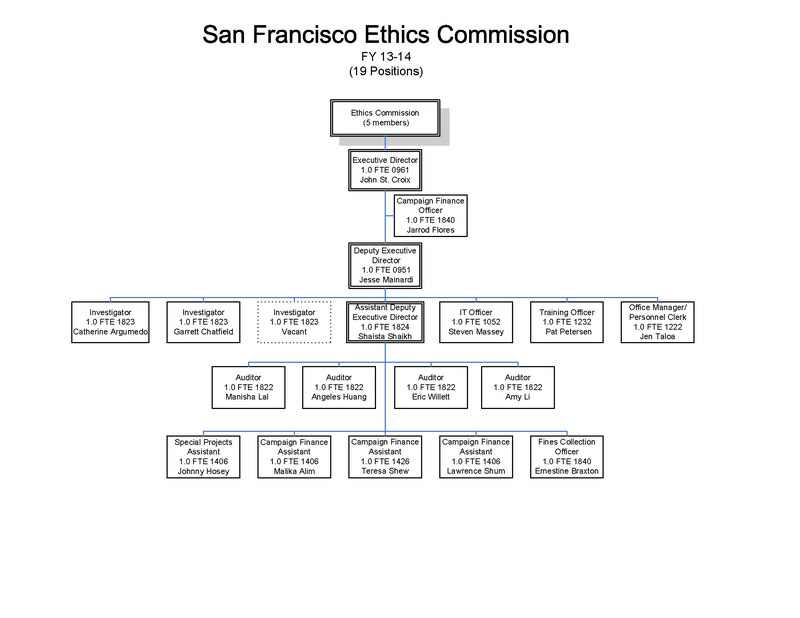 The Ethics Commission is pleased to present this report on the activities, progress, and accomplishments of its nineteenth year of operation to the Mayor, Board of Supervisors, and citizens of San Francisco. The Commission staff disseminated a comprehensive “Contributor Guide to Local Laws Governing Campaign Contributions.” The Guide summarizes the local laws applicable to campaign contributions, including contribution limits, who may make contributions to committees, and which contributors and committees are required to report their activities. In 2013, Ethics Commission staff met with staff members from the Fair Political Practices Commission, the Los Angeles Ethics Commission, San Diego Ethics Commission and Oakland Ethics Commission. Throughout the day-long meeting in Sacramento, staff from the different agencies learned and exchanged ideas about the FPPC’s new gift reporting app, upcoming and recent legislative and regulatory developments, enforcement matters and education programs. It was a very fruitful gathering. At its meeting on July 22, 2013, the Commission voted 3-0 (Hur and Studley excused) to adopt policies designed to streamline the handling of violations of certain provisions of the Campaign Finance Reform Ordinance by establishing fixed procedures and penalties for those violations. At its meeting on May 26, 2014, the Commission voted 5-0 to suspend enforcement of Campaign and Governmental Conduct Code section 1.114(a)(2), the aggregate limit on campaign contributions to City candidates in a given election, in light of the United States Supreme Court’s opinion in McCutcheon v. Federal Election Commission, No. 12-536. Commission staff worked with Supervisor Chiu and the City Attorney’s office on legislation amending the City’s Lobbyist Ordinance, which was signed by the Mayor on June 26, 2014. Most significantly, the legislation eliminated the monetary threshold necessary to qualify as a City lobbyist and replaced it with a bright-line “contacts” test. At its meeting on November 25, 2013, the Commission voted 3-0 (Hur and Renne excused) to approve regulations to clarify the reporting requirements of San Francisco Campaign and Governmental Conduct Code section 3.216, under which an elected officer who accepts a gift of transportation, lodging or subsistence for any out-of-state travel that is paid for in part by an entity other than the City, another governmental body, or a bona-fide educational institution, must file a report with the Ethics Commission. The November 5, 2013 Election Dashboard tracked candidate and ballot measure committee activity and included new graphs that track major donors, late contributions, and committee payments. The dashboard updates daily to include the latest filings. The Campaign Consultant Activity Dashboard summarizes quarterly campaign consultant activity with interactive charts and graphs. Staff updates the campaign consultant data quarterly after each filing deadline. Staff also back-entered campaign consultant data back to 2009, which can be downloaded in its entirety from the Commission’s web site. According to“Governing” magazine, the U.S. Open Data Census in March of this year rated San Francisco as the “best city for open data” in the country. The study involved gives both our lobbyist reporting system and our campaign finance system perfect scores. In November 2013, the Commission adopted regulations that would make filing of Sunshine Ordinance Declarations and Ethics Training (AB1234) Declarations easier, by allowing these documents to be filed by mail, facsimile or e-mail, as well as in person. Also in November, the Commission adopted regulations requiring candidates and committees using electronic signatures to provide information so that contributors will certify that they are not barred from making contributions under the Campaign and Governmental Conduct Code Section 1.126. At its meeting on November 25, 2013, the Commission voted 3-0 (Hur and Renne excused) to approve a regulation that provides a method by which candidates and committees may meet the due diligence requirements of the contractor ban under San Francisco Campaign and Governmental Conduct Code section 1.126. Under the regulation, candidates and committee that obtain signed remit forms from contributors which contain certain language regarding the prohibitions of section 1.126 would qualify for a “safe harbor” from penalties for receiving banned contributions from persons affiliated with City contractors. City officers filed the Statement of Economic Interests Form 700 electronically for the first time for the April 1, 2014 deadline. The Certificate of Ethics Training and Sunshine Ordinance are still submitted on paper and processed manually. In 2014, staff received 306 Certificates of Ethics Training and 435 Sunshine Ordinance Declarations. The number of late- and non-filers continues to decline. Following last year’s dramatic drop in late filings down to 48 from the previous year’s 150 (due in large part to a firm stance on denying waivers of late fines), this year saw a further reduction to 32 late filings. The number of individuals referred to the Fair Political Practices Commission (FPPC) for non-filing also dropped compared to last year, from 15 to 5. The FPPC rejected one referral concerning an individual who refused to file electronically, and instead delivered a paper Form 700 on April 1, 2014 which staff mistakenly accepted. The FPPC rejected the Commission’s referral because under state law, the Form 700 was timely filed, while the requirement to file electronically is a local law and therefore not a matter of enforcement for the FPPC. As of August 13, 2014, 2 of the original 5 individuals referred to the FPPC have yet to file their Form 700. Past experience with developing the NetFile campaign finance module and training its users contributed greatly to the success of the e-filing Form 700 rollout. Sufficient advance notice about the change to e-filing helped as well; the initial notification was in July 2013, filing officers began compiling information about their e-filers in November, and staff began follow-up communications in December. Written instructions were distributed in January 2014, and live trainings were offered in February and March. • unfamiliarity with using computers. Intake and processing of the Form 700, Sunshine Ordinance Declaration, and Certificate of Ethics Training is a coordinated effort among Commission staff. In previous years, a campaign finance staff person was also temporarily reassigned to help with the months-long task of scanning, redacting, and manually uploading the paper Form 700s, Sunshine Ordinance Declarations and Certificates of Ethics Training. This year, the temporary reassignment wasn’t necessary because the electronically-filed Form 700s – the largest segment of the paper filings – were available instantly on the Commission’s website upon receipt. The Commission also benefitted from the assistance of an intern, and will continue the practice in the future. Lobbyists are required by ordinance to register with the City and file monthly reports about any activity intended to influence local legislative or administrative action. The Commission reviews lobbyist statements to ensure that they are accurate and complete. The electronic filing process has enabled more timely filings and greater public access to individual lobbyist disclosure statements. The electronic database enables the public to conduct customized searches rather than tedious manual paper searches. New amendments to the Lobbyist Ordinance were enacted by the Board of Supervisors at the end of the 2013-2014 fiscal year, and will come into effect in the 2014-2015 fiscal year. At the end of the 2013-2014 fiscal year, 100 individual lobbyists were registered with the Commission, which was an increase over the last fiscal year of 14 lobbyists. Registered lobbyists reported receiving $5,320,187 in promised payments. Total revenues collected by the Commission amounted to $60,700, including $60,500 in lobbyist registration fees and $200 in late fines. Commission staff worked with Supervisor Chiu and the City Attorney’s office on legislation amending the City’s Lobbyist Ordinance, which was signed by the Mayor on June 26, 2014. Most significantly, the legislation eliminated the monetary threshold necessary to qualify as a City lobbyist and replaced it with a bright-line “contacts” test. An individual now qualifies as a lobbyist by making either: (1) one or more compensated lobbying contacts on behalf of a client, or (2) Five or more compensated lobbying contacts within one calendar month on behalf of his or her employer (unless the individual owns 20 percent or more of the employing entity). The legislation also modified certain exemptions from the lobbyist registration requirement and instituted reporting by certain permit consultants and developers, among other things. Campaign consultants are required to report names of clients, services provided for those clients, payments promised or received, political contributions, gifts made to local officials, and other information. Beginning with the first quarter of 2013, the Commission no longer issues quarterly report summaries of campaign consultant activity. Instead, information regarding all activity has been and will continue to be provided via the Campaign Consultant Activity Dashboard on the Commission’s website and made available for download through the City’s data.sfgov.org open data system. Staff continues to ensure that all consultants who are required to be registered with the Commission file their registration forms and pay their registration fees. During the 2013-2014 fiscal year, 29 campaign consultants were registered with the Ethics Commission. All registered campaign consultants filed the required quarterly reports. Out of 80 reports filed with the Commission, only 6 were filed after the required deadline. Campaign consultants reported receiving approximately $2.1 million in payments from registered clients. As of June 30, 2014, 22 consultants remained active and 22 clients were registered. Staff anticipates an increase in campaign consultant activity in 2014, as there are more contested seats, both local and statewide, as well as 12 local measures that have qualified for the November 2014 election. The Ethics Commission has the authority to investigate complaints that allege violations of certain state and local laws that relate to campaign finance, conflicts of interest, lobbying, campaign consultants, and governmental ethics. During the 2013-2014 fiscal year, 99 pending and/or new complaints were under review by Ethics Commission Enforcement staff. 78 complaints were resolved during the fiscal year; 63 of these complaints were determined not to be within the jurisdiction of the Commission and/or not to warrant further action. Throughout the year, the Executive Director’s Reports submitted to the Commission at each of its regular meetings show the number of complaints that have warranted further action. Chapter IV of the San Francisco Campaign & Governmental Conduct Code requires the Commission to investigate complaints filed with the Commission under section 4.105(b) alleging improper government activity, and complaints filed by City officers or employees or former City officers or employees alleging retaliation as defined in section 4.115(a). Cooperating with an investigation of a complaint conducted under the Ordinance. Section 4.130 requires the Commission to provide an annual report to the Board of Supervisors, reporting the following information: (1) number of complaints received; (2) the type of conduct complained about; (3) the number of referrals to the Civil Service Commission, other City departments, or other government agencies; (4) the number of investigations the Ethics Commission conducted; (5) findings or recommendations on policies or practices resulting from the Ethics Commission’s investigations; (6) the number of disciplinary actions taken by the City as a result of complaints made to the Ethics Commission; and (7) the number and amount of administrative penalties imposed by the Ethics Commission as a result of complaints made to the Commission. Pursuant to section 4.130, the Commission reports the following regarding complaints filed under Chapter IV during the 2013-2014 fiscal year: (1) 21 complaints received; (2) three complaints alleged improper governmental activity; 18 complaints alleged retaliation or other employment matters outside the Commission’s jurisdiction; (3) three complaints were referred to the Civil Service Commission, other City departments, or other government agencies; (4) zero; (5) none; (6) unknown; and (7) zero and $0. Last fiscal year, the Commission approved new enforcement regulations for handling violations of the Sunshine Ordinance; the Commission removed references to the Sunshine Ordinance from the Regulations for Investigations and Enforcement Proceedings and violations of Sunshine Ordinance are now handled under their own set of rules. These regulations went into effect on January 25, 2013. From that date through the end of this fiscal year, the Commission has held ten public hearings regarding violations of the Sunshine Ordinance. Staff may propose additional policies regarding the process of handling of violations of the Sunshine Ordinance before the Commission. During the year, staff provided or participated in 11 trainings or meetings related to matters within the jurisdiction of the Ethics Commission. The Commission hired an educator/outreach coordinator in October 2013. In addition to providing training related to the electronic filing of SEIs keeping training materials current, the individual in this position will maintain the reporting programs for Major Developers and Permit Expediters that were approved recently by this Commission. The Commission is charged with interpreting and applying the campaign, lobbying and governmental ethics laws under its jurisdiction, requiring that it consider requests for waivers, which it routinely does, and that it issue formal and informal written advice on matters requiring interpretation. Commission staff is available each workday to answer public inquiries about City campaign, lobbying and governmental ethics laws. During the course of the year, the number of inquiries runs into the hundreds. During FY 13-14, the Commission continued its efforts to improve electronic data access and migrate additional paper forms to electronic format. In May 2013, the Commission passed regulations requiring elected officials, department heads, and members of decision-making boards and commissions to file the Statement of Economic Interests (Form 700) with the Ethics Commission in electronic format. City officers filed electronically using the Commission’s electronic filing system for the first time for the April 1, 2014 annual filing deadline. All electronically filed statements were made instantly available on the Commission’s web site upon receipt. In July 2013, the Commission implemented new regulations passed in May 2013, which requires mandatory electronic filing of campaign finance statements for all local committees. Committees filed electronic statements for the July 31, 2013 semi-annual deadline using the Commission’s electronic filing system and committee officers used the Commission’s new Signature Verification Card to authenticate their electronic signature. The Commission’s new signature verification system allows committee officers to electronically sign statements using the City’s electronic filing system, third-party vendor software, or a mobile app. Committee officers that sign campaign statements must verify their signature in the presence of Commission staff or a notary public and in return receive an electronic ID and PIN number to sign statements. In addition, staff released a complete list of all of the filers in the Commission’s campaign finance records database. The list includes over 3,300 individuals and committees including their current names, committee types, filing status, ID numbers, and committee officer names including treasurer, assistant treasurer and controlling candidate. The list can be searched and downloaded on the Commission’s web site and will assist users researching committees on the Commission’s campaign finance database. In August 2013, the Commission launched a new dashboard on the Commission’s web site for the November 5, 2013 election. The 2013 dashboards expanded on the 2012 dashboards by adding easy-to-read charts and graphs to summarize general purpose committee and major donor activity, late contributions, and committee cash balances and debts. In addition to the election dashboard, the Commission launched a new dashboard to track campaign consultant activity. Commission staff compiled four years of historical data filed on paper campaign consultant disclosure reports and published the data on the City’s DataSF web site. Commission staff summarized the data into charts and graphs and displayed the information on the new dashboard. The data, and respective charts and graphs, are updated quarterly and are available to the public to view and download. In March 2014, the Mayor’s office presented an analysis of the publicly accessible datasets posted to the City’s DataSF web site to the Committee on Information Technology. The Ethics Commission was determined to be the largest contributing department to the City’s open data efforts with the greatest number of datasets on the DataSF web site. The Commission posts data to DataSF related to lobbyists, campaign consultants, campaign finance, enforcement and conflict of interests. The Commission compiles all campaign and lobbyist filings on DataSF so that the information may be searched and aggregated. In fact, the Commission uses the campaign and lobbyist data on DataSF to aggregate and visualize the data on the Commission’s web dashboards. Further, according to “Governing” magazine, the U.S. Open Data Census in March of this year rated San Francisco as the “best city for open data” in the country. The study involved gives both our lobbyist reporting system and our campaign finance system perfect scores. The Commission’s web site traffic decreased from FY 12-13. Contributing factors to the decrease in traffic might include the off-year election in which all of the candidate races were uncontested and the spike in traffic in FY 12-13 from the official misconduct hearings. In addition, a significant amount of the Commission’s information is now available from the City’s DataSF web site. There were 144,723 “pageviews” of the Commission’s web site, a 14 percent decrease over FY 12-13. Despite the drop in traffic to the Commission’s web site, the Commission’s web site became the top referrer of traffic to the City’s DataSF web site. The Commission’s annual approved budget totals are below. Please note that recent years indicate “non-grant funding.” Non-grant funding is the actual operating budget of the Commission. The remaining funding for each of those years are deposits into the Election Campaign Fund and are used exclusively for payments to publicly-financed candidates for Board of Supervisors and for Mayor. Commissioner Beverly Hayon was elected to serve as Chair at the April 1, 2013 meeting and Commissioner Paul Renne was elected to serve as Vice-Chair. Commissioner Ben Hur was elected to serve as Chair at the February 24, 2014 and Commissioner Paul Renne was re-elected to serve as Vice-Chair. The Ethics Commission had a staff of 18, supported by interns throughout the year. Staff included Executive Director John St. Croix; Deputy Executive Director Mabel Ng (who retired in January of 2014); Deputy Executive Director Jesse Mainardi (who joined the staff in March of 2014); Assistant Deputy Director Shaista Shaikh; Auditors Angeles Huang, Amy Li, Alex Lewis-Koskinen (who left the staff in February 2014), Manisha Lal (who joined the staff in December 2013) and Eric Willett (who joined the staff in May 2014); Office Manager Jen Taloa; Campaign Finance Officer Jarrod Flores; Fines Collection Officer Ernestine Braxton; Campaign Finance Assistants Teresa Shew and Lawrence Shum; Investigators Garrett Chatfield and Catherine Argumedo; IT Officer Steven Massey; Education and Outreach Coordinator Patricia Petersen (who joined the staff in November 2013) and Special Projects Assistant Johnny Hosey. During the fiscal year, the Commission was fortunate to have had the services of several interns: Ava Ameril, a 2014 graduate of UC Berkeley; Giovanni de Leon, a student at the Ruth Asawa San Francisco School of the Arts; Nan Li, a student at Palo Alto High School; Randy Russell, a student at SFSU; Alana Taloa, a student at Chabot College; and Amanda Tan, a student at UC Berkeley. The Commission will work with filers to implement the electronic filing of the Form 700 Statement of Economic Interests (SEI). The Commission will provide expanded training on local and state ethics rules that govern City officers and employees. The Commission may propose regulations or amendments to the Campaign Consultant Ordinance to require that filings be submitted electronically by campaign consultants. The Commission will continue its efforts to implement electronic filing only for all disclosure forms and declarations submitted to the Commission. The Commission will work with the City Controller’s office to reduce the backlog of pending audits of candidates and campaign committees. The Commission will pass regulations to interpret and implement the City’s Lobbyist Ordinance, including recent amendments to that ordinance. The Commission will issue forms and implement programs for new reporting requirements for permit consultants and for developers of major City real estate projects. The Commission may propose amendments to the Campaign Finance Reform Ordinance to clarify the City’s disclaimer and reporting requirements for campaign communications by City candidates and by third parties, institute more frequent reporting requirements for certain communications, and otherwise harmonize City requirements with state law. The Commission may consider changes to its enforcement procedures and its policies for handling late filers and non-filers of campaign reports. The Commission will produce and publicly disseminate “infographic” representations of collected campaign finance data collected during the 2014 election cycle. The Commission will issue a new Lobbyist Manual, which incorporates the changes to the Lobbyist Ordinance as well as the Commission’s new regulations. The Commission agreed with several recommendations in the recent Civil Grand Jury report, and will work to implement these measures in the near future, and will review the progress made six months after the date of adoption.